Rockit Bootcamp, Tempe’s first-of-its-kind web development training program, is graduating its fourth cohort at the end of June, which means students will be able to show off three months of hard-earned skills at Rockit’s Career Fair. 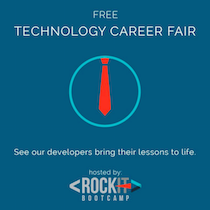 But this isn’t your ordinary career fair: on June 25, local companies and employers in need of qualified web developers will visit Rockit’s campus to witness the current students showcasing and presenting their application’s code to an industry expert panel of developers. The program’s last Career Fair brought 15 local companies, including American Express, Vonage subsidiary Telesphere and The Nerdery, a growing software design company new to Phoenix. Each company was able to interview students to fill needed jobs and some, including Tag Employer Services, hired a student immediately after meeting them at the fair. Rockit’s Project Presentations and Career Fair are beneficial for both students and companies alike. Through numerous conversations with web development, technology and business leaders in the Phoenix area, we understand the need to connect businesses to qualified, skilled web developers to help bridge the skills gap that is slowing our city’s economy. For employers, Rockit is offering the ideal candidates coming out of the program. And for students, Rockit’s web development training prepares them to enter the tech industry after just 12 weeks, earning an average of $15,000 more than their previous salary.